There are cleaning chores that need to be done daily, while others need to be done weekly. What about those cleaning jobs that only need to be done about once a month? Those are the cleaning jobs that are the toughest to remember! To help us all out, I’ve got some monthly cleaning ideas for those jobs. Let’s talk about what they are, and how you can make sure you always get them done. Stay on top of these monthly cleaning ideas and your home will always look its best! How many of us actually clean our windows monthly? I admit it doesn’t always happen–but it should. One reason is because if you do clean your windows monthly, they don’t get as dirty. That makes the whole job easier! It’s also cheaper, because if your windows are only slightly dirty, you can totally get away with using water only. For really dirty windows, use a commercial window cleaner for best results. If you’re cleaning the windows monthly, it makes perfect sense to dust the window blinds at the same time. Pull a couple of white tube socks over your hands. Slightly dampen the socks with water, and use them to pull dust from each slat. It’s pretty easy, and if you do it monthly it doesn’t become a huge once-a-year chore! It’s recommended to clean the mirrors around your home monthly. If you’re like me, you clean your bathroom mirrors weekly because they usually need it. But decorative mirrors in other living areas of your home can be cleaned monthly. Use a commercial glass cleaner for best results, along with a lint-free microfiber cloth. 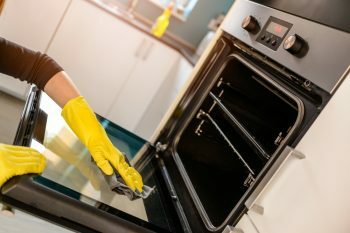 An important part of any list of monthly cleaning ideas should include the oven and stove top. Sometimes those jobs, particularly the oven, get left until it’s an impossibly dirty task. Stay on top of it by doing it monthly. A baking soda paste works wonders on the inside of the oven glass. You’ll actually be able to see what you’re baking! 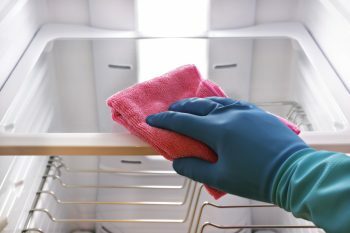 Cleaning out the refrigerator should be included in monthly cleaning ideas. Even if you don’t actually wipe down all the shelves each month, you should still go through and pull out expired food and get rid of it. Then you can wipe down shelves that need it. If a spill happens, don’t wait til your monthly cleaning day–get on it so it doesn’t dry and get sticky. Your life will be so much easier! 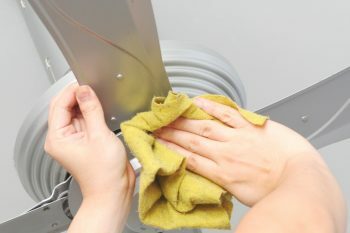 Dust your ceiling fan blades every month. A microfiber cloth works great to grab onto the dust, but if you want to trap more dust, try a pillowcase. Just slide the open end over the blade, and grip the blade as you pull the pillowcase back off. All the dust will be trapped inside the pillowcase and save your furniture and floors from needing a good dusting afterward. 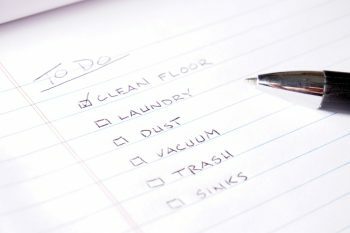 Schedule a specific day of the month to perform these monthly cleaning ideas, such as the 2nd Saturday or 1st Monday, or whatever works for you and your life. Your home is about to be cleaner than ever! You didn’t mention carpet cleaning here. A clean carpet is important both for the appearance of your home and the health of the people who live in it. Stains and dingy carpet can detract from a peaceful atmosphere, while allergens and dirt can contribute to respiratory problems. 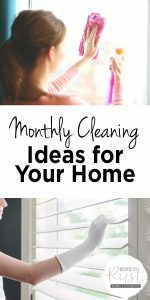 These are just some ideas for monthly cleaning in your home! You’re absolutely right that keeping a clean carpet is very important. 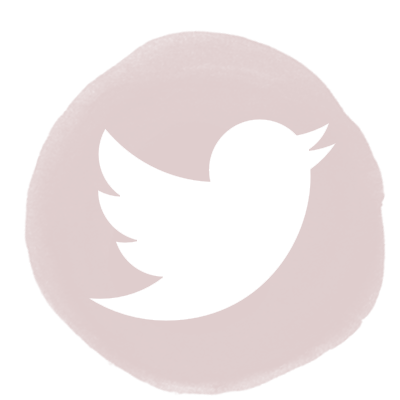 Thank you for sharing with all of us!